Trans pulmonary pressure is the pressure applied on the parenchyma cells of the lungs during respiration. Basically, it is the result of pressure obtained by the difference of alveolar pressure and the intra pleural pressure. The intra pleural pressure is outside the lung and the alveolar sac is inside the lung body. So, it is the pressure which passes from the lung by crossing pleural space to the alveoli. The respiration occurs as a result of difference in alveolar pressure and intra pleural pressure. The intra pleural pressure is subtracted from the alveolar pressure. The pressure in the lung body fluctuate as compare to the atmospheric pressure for the regulation of air flow between atmosphere and lungs. The Trans pulmonary pressure can be measured by a device named pressure transducers. The alveolar pressure is measured by holding the patient’s breathe and measuring the alveolar pressure in lung body. The Trans pulmonary pressure is applied to the lung while inspiration. The intra pleural pressure is always high as compare to the alveolar pressure during inspiration and carries a negative sign with its pressure value. The measurement of Trans pulmonary pressure leads to the diagnosis of many vascular pulmonary diseases. Where Ptp is the Trans pulmonary pressure and Palv is the alveolar pressure and Pip is the intra pleural pressure. The alveolar pressure is relatively smaller and intra pleural pressure carries a negative sign. This difference is necessary for the air flow in lungs. If, the pressure difference become equal to zero, the lungs will collapse and the patient can die. The trans pulmonary pressure always carries a positive sign whereas the alveolar pressure fluctuate from negative to positive sign along the inspiration and expiration of air. The Trans pulmonary pressure, as we know, is always positive and the intra pleural pressure makes it positive. The inspiration is a process in which the air enters into the body while expanding the intercostal muscles (external) along with diaphragm. As a result the volume in the thoracic cavity increases. 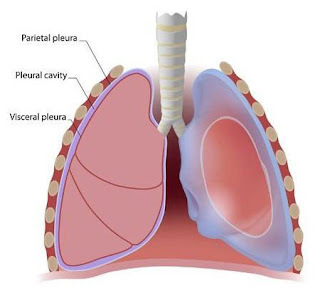 The more air enters into the body, the more pleural pressure become negative and ultimately, this negativity will make the Trans pulmonary pressure more positive. The net result of the Trans pulmonary pressure is always high in inspiration as compare to expiration. As discussed before, the Trans pulmonary pressure is the difference of two pressure i.e. alveolar pressure and intra pleural pressure. But, the Trans pulmonary pressure gradient is measured by the difference in the pulmonary arterial pressure and left atrial pressure. The normal value of trans pulmonary pressure gradient is less than or equal to 12 mm. if, it goes above 12 mm then there are chances of pulmonary hypertension. Even a little increase or decrease in value can lead to various problems related to heart and lungs because these two are strongly inter related with each other.